CarpeTempus is free, open-source and is licensed under the GPL. And there are no ads. 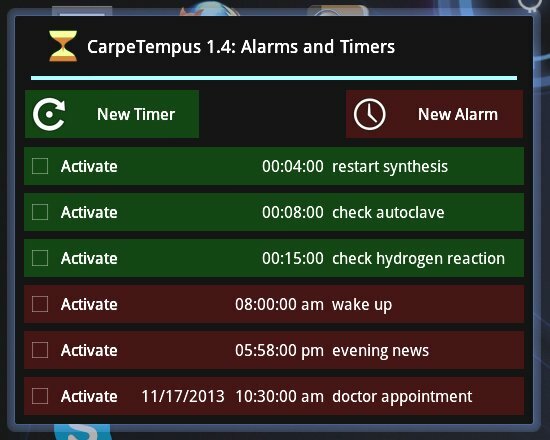 CarpeTempus is a complete, powerful Android alarm/timer application. CarpeTempus requires Android version 3.2, API 13, or newer. CarpeTempus will accept any number of alarms (particular time of day, and day of week, month, year, etc.) or timers (durations in seconds. minutes. hours, etc.). When it's time for CarpeTempus to alert you, it will speak the message you choose, or play an alarm ringtone, or play a piece of music you choose. The CarpeTempus alarm scheduler is very sophisticated — you can choose a time of day, one or more days of the week, one or more days of the month, or a particular day of the year — or any combination of these. CarpeTempus timers are much like alarms, except they're meant for time durations, not times of day. You can set time durations from one second to 100 hours. When the time arrives, all the features of the alarm scheduler are available — spoken messages, ringtones or user-selected music. Once you have programmed some alarms and timers, you can put your Android device in standby mode. Then, when it's time for an alarm, the CarpeTempus service daemon will wake up, turn on the display, and alert you. It's not necessary to type reminder messages. To program a CarpeTempus message, you can speak the message instead of typing it. CarpeTempus is free and open-source, and is licensed under the GPL. One more thing — CarpeTempus has no ads, no tricks and no strings attached. CarpeTempus is exactly what it appears to be — a nice, free application. Hello — I'm Paul Lutus, author of CarpeTempus. I've been writing software for about 35 years and have written some very well-known titles (Apple Writer, Arachnophilia). CarpeTempus is one of my first Android applications — I wrote it because (as before) there were no Android programs that could give me what I needed. Existing programs were missing features that I regarded as essential, like a mixture of alarms and timers in one program, the ability to speak a reminder message, the ability to play any music I wanted as an alarm sound, and the ability to set timer durations to the second. I hope you like CarpeTempus. And stay tuned — I'll be writing more Android programs in the future. The easiest way to get CarpeTempus is to visit the Google Play Store's CarpeTempus page — this method is secure and it checks for compatibility with your Android device. 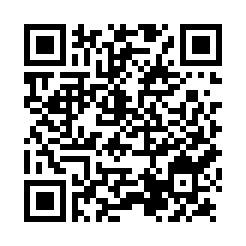 The next-easiest way to get CarpeTempus from a camera-equipped Android device is to take a picture of the QR code at the top of this page and download the result. Another way is to use another computer to download the CarpeTempus file, then download it onto your Android device. Programmers: CarpeTempus is open-source and licensed under the GPL. Click here to download the source archive. To create a new timer, press "New Timer". To create a new alarm, press "New Alarm". To change the time, press its time display. To change an alarm's date, press its date display. To show the setup dialog, press the message at the right (see "Setup Dialog" below for details). To activate the alarm/timer, press "Activate." When activated, timers begin counting down, so you see how much time remains. To deactivate a timer/alarm, press "Activate" again. To edit an existing message, press the message to show the soft keyboard. To create a new message, press "New" to erase the existing message and show the soft keyboard. While the keyboard is displayed, to speak your message instead of typing it, press the microphone icon at the lower right. To set a different time, press the time display. To make the alarm a daily event, press "Recurring." To choose the number of repetitions of the alarm message, press "Repetitions." If you just want a time-of-day alarm, you're done — press "Accept", then press "Activate." To choose a specific date, press "Specific Date," then click the date to make your choice. To choose days of the week, click "Days of Week" and pick any combination. To choose days of the month, click "Days of Month" and pick any combination. If you enable both days of the week and month, CarpeTempus will only sound an alarm when both are true — the right day of the week and month. This would only be useful if you wanted to sound an alarm every Friday the 13th. 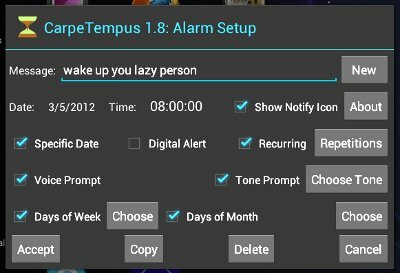 At alarm time CarpeTempus normally speaks your message, but if you prefer a tone or music, disable "Voice Prompt" and enable "Tone Prompt". Press "Choose Tone" to choose a specific ringtone. To add your own music to the "Choose Tone" list, simply place the desired music files on your Android device in the /sdcard/Ringtones directory. If you don't have a way to add music files to your Android device, you may want to get another of my Android programs: "SSHelper". If you want to preserve your changes as well as make a copy of the present timer or alarm, press "Copy." To accept your changes, press "Accept." To cancel your changes, press "Cancel." To delete an alarm or timer, press "Delete." Remember to "Activate" the alarms you want to sound. CarpeTempus doesn't need to be visible to provide alarm services. If your android device is in standby mode when an alarm time arrives, CarpeTempus will wake it up and sound your chosen alarm. If you don't want a particular alarm to sound, just deactivate it (press "Activate") and CarpeTempus willl preserve it in a disabled state. If you want to delete an alarm or timer, press its message to make the setup dialog appear, then press "Delete." To have a silent alarm — an alarm dialog with no sound — disable both "Voice Prompt" and "Tone Prompt". If you prefer a 24-hour clock instead of AM/PM, set this in the Android "Settings" applet, and CarpeTempus will show 24-hour clock times too. The "Digital Alert" option in the setup dialog shows a digital instead of analog clock in the alarm dialog. If you aren't using any alarms or timers and you want to prevent CarpeTempus from using system resources to monitor the time of day, just disable all alarms and timers — this will make CarpeTempus dormant until you reactivate an alarm or timer. CarpeTempus is free, it doesn't show ads, it's not crippleware or shareware, and I don't want your money. I just thought I would make that clear up front. CarpeTempus is Copyright 2012, P. lutus and is released under the GPL. Here is a source archive for CarpeTempus, organized as an Eclipse Android project. 08.06.2018 Version 4.7. Solved an issue that prevented the updated CarpeTempus from functioning on pre - 8.0 Android versions. 08.04.2018 Version 4.6. Fixed a bug that deleted user alarm data in some circumstances. 08.04.2018 Version 4.5. Revised code to allow autostart on Android 8.0+ versions. 08.02.2018 Version 4.4. Changed target SDK to 26, a recent Google requirement. 04.23.2014 Version 4.3. Added hint text to sometimes-empty entries, prevented a problem caused by an empty string. 03.16.2014 Version 4.2. Fixed a bug that caused a program exception in some circumstances. 03.13.2014 Version 4.1. Revised layout for easier use, added confirmation dialog for event deletion, changed date dialog to permit "Cancel" in all Android versions. 03.10.2014 Version 4.0. Recoded the daylight time management routines to address a rather complex standard/daylight time transition problem. 11.06.2013 Version 3.9. Fixed a problem with the text-to-speech feature. 11.05.2013 Version 3.8. Added a periodic timer to check for time zone change and reset alarms as required. 07.27.2013 Version 3.7. Changed screen wake protocol on alarm to allow screen timeout after user dismisses dialog. 07.10.2013 Version 3.6. Redesigned user interface for more usability and consistency with typical Android apps. 06.06.2013 Version 3.5. Increased alarm/timer color brightness and contrast to more easily distinguish them on dark displays. 04.14.2013 Version 3.4. Fixed a bug that prevented some date / day of month / day of week alarms from functioning in some time zones. 03.11.2013 Version 3.3. Fixed a bug that sometimes prevented correct alarm updates when timezone was changed or daylight time began or ended. 12.07.2012 Version 3.2. Fixed a bug that prevented copying timer duration to time setting dialog. 11.11.2012 Version 3.1. Another approach to guard against Android killing off my timers. 11.10.2012 Version 3.0. Recoded the alarm timer/service routines to resist Android's efforts to kill off my timers. 11.09.2012 Version 2.9. Fixed an occasional missed-alarm issue. 11.06.2012 Version 2.8. Corrected a daylight-time related anomaly. 08.08.2012 Version 2.7. Aded an option to allow recurring timers. Pre-version 2.7 users will find that already-defined timers are in recurring mode — these users should simply choose non-recurring mode. New timers will default to non-recurring mode. 07.12.2012 Version 2.6. Refactored alarm activation code for more robustness and less resource consumption, changed new-alarm default to active. 07.04.2012 Version 2.5. Fixed a bug that sometimes caused an alarm to be skipped. 04.28.2012 Version 2.4. Detected and fixed a subtle bug that might have waited years to appear in normal use. 04.26.2012 Version 2.3. Fixed a bug that sometimes prevented restarting of the next-alarm timer. 03.25.2012 Version 2.2. Fixed a bug that crept in during last revision. 03.25.2012 Version 2.1. Improved the alarm timer behavior to better conserve device battery life. 03.16.2012 Version 2.0. Adjusted the new time monitoring code for more robustness. 03.15.2012 Version 1.9. Changed how the application monitors the time of day. 03.12.2012 Version 1.8. Added an option checkbox to hide the status notification icon. 11.29.2011 Version 1.7. Fixed a minor bug that prevented correct sorting of the alarm event list, and another having to do with canceling an alarm. 11.20.2011 Version 1.6. Fixed a bug in the day-of-month and day-of-week testing code. 11.19.2011 Version 1.5. Cleaned up class instantiation code, added the ability to make a copy of an existing timer or alarm. 11.18.2011 Version 1.4. Added the ability to choose the number of repetitions of the alarm message before giving up. 11.16.2011 Version 1.3. Fixed a bug in the service initialization code. 11.15.2011 Version 1.2. Rewrote the alarm timing code to accommodate the fact that the operating system doesn't provide a time slice every second. 11.15.2011 Version 1.1. Fixed occasional fail wake-from-standby issue. 11.13.2011 Version 1.0. Initial Public Release.